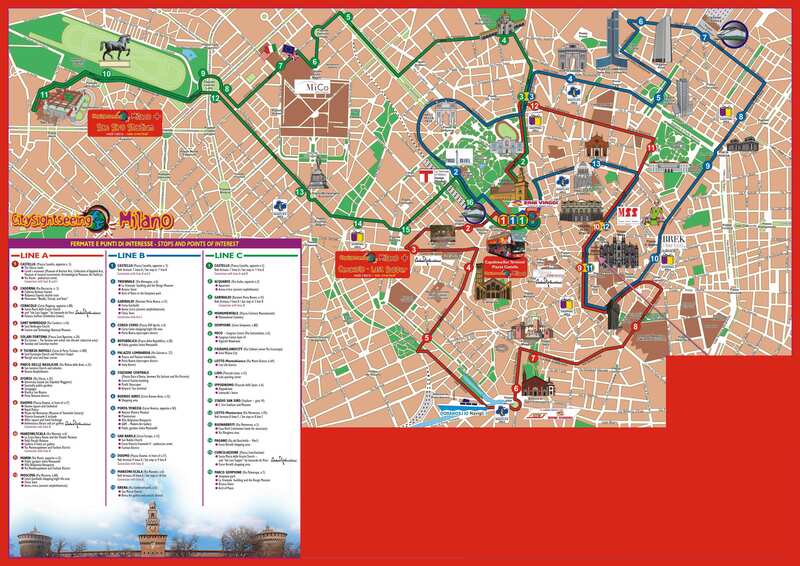 Milan City Sightseeing Hop-On Hop-Off buses is an easy and comfortable way to see all of Milan. Hop-Off Milan Tours provide you with the best Milan has to offer Book your tickets for City Sightseeing Milan here! Castello, Parco Basiliche, Duomo, Manzoni - Scala, Moscova, Garibaldi, Repubblica, Porta Venezia, San Babila are just some of the stops you will enjoy along the way. You can of course stop and get of the buses to see all the attractions and highlights Milan has to offer incl. The Gallery of Modern Art, Duomo di Milano, Galleria Vittorio Emanuele II, Leonardo da Vinci National Science And Technology Museum, Theatre Museum at La Scala, Milan Aquarium, Basilica of Sant'Ambrogio and many, many more! See a MAP OF THE ROUTES HERE! - Departure frequency betwen 30-45 min. all year round. - First bus departure at approx. 09.30am. - Our tickets are either valid for 24 hours or 48 hours - unlimited travel. - Our tickets are valid 1 month from booking date! - Our vouchers/e-tickets, which will be send to you after you have completed your booking, provide you direct access to the busses. You simply board a bus where you like to start your tour, and here you get your tickets and detailed map of the routes. - Children age is from 4 to 13 years old. Children at 3 years of age, or younger, travel free with a paying adult! - No entrance fee to any attractions, museums or highlights are incl. in the ticket price! - See ALL Milan City Sightseeing Hop On Hop Off Tours HERE! Both Routes operates daily year round. See departure frequency to the left!